Rev. Peter Hullermann was convicted of abusing minors in 1986 but later resumed his work with the church. Berlin, Germany (CNN) -- The German Cabinet met Wednesday to discuss ways of tackling child abuse in the Catholic church and other institutions as a new allegation surfaced against a suspended priest. Government ministers discussed the makeup of a round table on child abuse and prevention, set to meet April 23. The government also named a special representative for child abuse matters. Christine Bergmann is a former minister for family affairs and her post should now be a go-to point for victims of child abuse, the government said. The new allegation is against the Reverend Peter Hullermann, who was convicted of abusing minors in 1986. Hullermann's case made headlines in Germany last week when it emerged the archdiocese ignored warnings to keep him away from children when it was headed by Pope Benedict XVI, who was then Cardinal Joseph Ratzinger. A news release from the Archdiocese of Munich identified him only as "suspended Reverend H" and says the abuse allegedly happened in 1998 in the town of Garching, near Munich, but Hullermann was the only one serving there at the time who has now been suspended. The statute of limitations on the case has not expired, the archdiocese said. The alleged victim was under age at the time, it said. After his conviction in 1986, Hullermann was given an 18-month suspended sentence and a fine of 4,000 deutschmarks (about $2,000 at the time). But he was then allowed to resume his priestly work and he continued to work with children, even though a psychoanalyst who had examined him demanded that Hullermann never be allowed to interact with minors again. The psychoanalyst, Werner Huth, had regularly done psychoanalytical evaluations for the church and had Hullermann in therapy from 1980 to 1992. 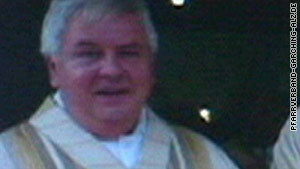 Huth told CNN last week he does not believe Pope Benedict was ever aware that Hullermann had returned to service, but Huth said he warned other church officials about the priest's pedophilia many times. Garching Mayor Wolfgang Reichenwallner told CNN the archdiocese never informed him that Hullermann had a history of pedophilia. The archdiocese said the case has been sent to the state prosecutor's office and that no further information will be given. Hullermann was suspended earlier this month as information about his past started coming to light. -- CNN's Frederik Pleitgen contributed to this report.